We’d love your help. 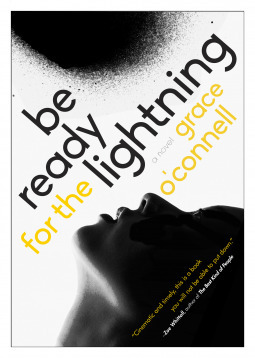 Let us know what’s wrong with this preview of Be Ready for the Lightning by Grace O'Connell. On the surface, Veda's life in Vancouver seems to be going just fine--at nearly thirty, she has a good job, lifelong friends, and a close bond with her From acclaimed New Face of Fiction alumna Grace O'Connell, a suspenseful, poignant and provocative tale about violence, sibling love, friendship, heroism--all told through the lens of a young woman trapped in a hijacked bus. To ask other readers questions about Be Ready for the Lightning, please sign up. It embarrassed me to love him, when everybody else did too. In the books I read, girls who like boys were vapid B-characters. The protagonists were always girls who hated the main boy, had bigger things on their minds, but who ended up with him anyway. I wanted to be like that, to be a main character with better things to do than fall in love. But what did I know? Maybe love was supposed to be embarrassing. Intrigued by the title and the cover, I was absolutely blown away by the prologue whic It embarrassed me to love him, when everybody else did too. In the books I read, girls who like boys were vapid B-characters. The protagonists were always girls who hated the main boy, had bigger things on their minds, but who ended up with him anyway. I wanted to be like that, to be a main character with better things to do than fall in love. But what did I know? Maybe love was supposed to be embarrassing. Intrigued by the title and the cover, I was absolutely blown away by the prologue which happens to begin with our main protagonist, Veda, and other people being taken hostage by a man styling himself like Peter Pan(not dressing like him, but making the literary connections). But the chapters alternate and take readers on the before and after of the events that will unfold on that bus. This did frustrate me a bit because I was fixated on the present and I grew impatient to know why the past could be so relevant to what was actually happening on that bus. There were so many unhealthy relationships in this book that it's actually hard to choose which one was the worst. It really created an unsettling atmosphere throughout the book and I certainly was hoping/anticipating some type of twists and when it came- it was totally anti-climatic. Why do I say this? Well, the book dragged quite a bit and I was left asking myself "what was it all about?" Personally, Be Ready for the Lightning was just an okayish read for me. A group is kidnapped by a Peter Pan figure and the author mixes the before the event and the future of what happened after the event. Interesting method that leaves you wondering what happened and why and all the scenarios that one can think of. If I had to use one word to describe Be Ready for the Lightning by Grace O’Connell, I would say vivid; from the descriptions of the scenery to the characters, everything in this book was so intricately developed and detailed. I could smell the smells and hear the sounds. I felt like I knew these people, they were my friends and my confidants. Throughout my reading, I felt a visceral attachment to them, which made this one feel suspenseful and explosive. O’Connell is a master of imagery and I was If I had to use one word to describe Be Ready for the Lightning by Grace O’Connell, I would say vivid; from the descriptions of the scenery to the characters, everything in this book was so intricately developed and detailed. I could smell the smells and hear the sounds. I felt like I knew these people, they were my friends and my confidants. Throughout my reading, I felt a visceral attachment to them, which made this one feel suspenseful and explosive. O’Connell is a master of imagery and I was captivated by her prose. The novel opens like every other day. Veda has just moved from Vancouver to New York, running from her complicated relationship with her brother, and is starting her day like every other day: by almost missing her bus. As she gets on just in time and begins to the monotony of her bus ride, a man a hijacks the bus and shoots the driver. Veda finds herself in an unpredictable hostage situation. The narrative style of this novel was incredibly unique and interesting. The novel is told in several sections and in several time periods. It is told partially in the relative past as Veda experiences the events on the bus, partially in the present as Veda deals with the aftermath of the ordeal and the rest, told in flashbacks, as Veda remembers moments from her childhood and timelines the relationship with her brother, Conrad as they grow up in a Vancouver suburb. I couldn’t help but consistently wonder how all these pieces would fit together and how her past experiences would help her in the present. Veda, as a character, is very observant. Constantly taking inventory of things around her. I found this to add to the tone that O’Connell sets throughout the novel. No detail is missed and no stone is left unturned. This is absolutely a slow burn of a read, definitely not a fast-paced, in your face style of thriller. But don’t get it twisted, this one, although not the type of novel I am usually into (I know I complain about slow moving books ALL THE TIME), Be Ready for the Lightning had me grabbing on to every word and holding my breath. I could not wait to see what would happen and how this would pan out. This was quite different than what I had expected it to be, given that from its blurb I imagined this would strictly be a tense thriller that takes place on a hijacked bus. Instead, it's a thoughtful reflection of a young woman's life - before the bus she gets on one afternoon is hijacked by a mentally disturbed man, during the ordeal, and afterward. Veda is the main character, but you really get to know all of the people in her life as much as you get to know her. For such a relatively short boo This was quite different than what I had expected it to be, given that from its blurb I imagined this would strictly be a tense thriller that takes place on a hijacked bus. Instead, it's a thoughtful reflection of a young woman's life - before the bus she gets on one afternoon is hijacked by a mentally disturbed man, during the ordeal, and afterward. Dreamy, shocking, uncomfortable, and luminous. This is a delicious read to sink into, switching back and forth between Veda's suburban Vancouver upbringing among a close-knit group of friends and a surreal bus heist in NYC. There's something here for every reader- tense crime drama, poignant coming-of-age narrative, vivid-characters, a thwarted romance, and so much more. For fans of Maile Meloy, Emma Straub, and Meg Wolitzer. The book opens with the main character Veda involved in a hostage situation on a New York City bus. After the opening chapter, the story jumps back in time to Veda's childhood in Vancouver. The rest of the book alternates between this childhood in which Veda's brother and their circle of friends play a predominant role, the hostage situation, and many points in between. I'm afraid that I didn't love this book. Although the writing was good, I just didn't connect with any of the characters which meant that I wasn't invested in discovering their outcomes. And the outcomes didn't even really materialize. Now I definitely don't like having my story endings all neatly concluded and wrapped up with a nice bow but this book left so many unanswered questions that it just ended up being an unsatisfying read. Given the level of excitement and intrigue with which the book opened, I expected so much more. A very moving and beautiful story – it has a central, gripping plot for sure, of the bus hijacking – but for me, the central tension revolved around the difficulties of growing up. How do we grow into our own skins, and how do we relate to our siblings and friends as they find their peace (or not) of being adults in a trying reality? Perfectly paced and written with Grace O'Connell's tight signature prose, I am hoping for a sequel. In Be Ready for the Lightnng, the storyline moves back and forth between Veda's life in Vancouver beginning in her childhood and a hostage taking on a bus in New York. Grace O'Connell writes very well, it just seemed as if the two plot lines didn't gel. The back story took away from the hostage incident as I was anxious to return to Veda's life in Vancouver with her mercurial brother, Conrad. Not quite to my tastes, but it will be enjoyed by many. Thanks to Penguin Random House Canada for an ARC In Be Ready for the Lightnng, the storyline moves back and forth between Veda's life in Vancouver beginning in her childhood and a hostage taking on a bus in New York. Grace O'Connell writes very well, it just seemed as if the two plot lines didn't gel. The back story took away from the hostage incident as I was anxious to return to Veda's life in Vancouver with her mercurial brother, Conrad. Not quite to my tastes, but it will be enjoyed by many. This story of a woman who survived a hostage situation on a bus is fascinating. It is well written and the characters memorable. The question of what causes an ordinary person to erupt into violence is one no one seems able to answer. Another great book by a Canadian writer. Thanks to Goodreads for the giveaway. A powerful examination of the strength of the human bond in even unfathomable circumstances. Please read all of my reviews at http://ultraviolentlit.blogspot.ca! Be Ready for the Lightning is a fascinating story about a hostage situation on a New York City bus, as experienced by a young woman named Veda, and the long-lasting connection she feels for her attacker. The novel is punctuated by this extreme event, but it is also a close-up look at Veda’s life before and after the incident, and her complicated relationship with her brother Conrad and their childhood friends. Veda and Conrad gr Please read all of my reviews at http://ultraviolentlit.blogspot.ca! Veda and Conrad grew up in Vancouver with loving parents and a close-knit group of friends, including Conrad’s best friend Ted, and siblings Annie and Al. Veda always had a crush on Ted, but it is not until he returns to Vancouver in their early twenties that they begin a relationship, which is plagued by Ted’s excessive drinking. Veda and Conrad had always been very close as children, but Conrad’s violent tendencies – possibly caused by a childhood head injury – are increasingly out of control. When Veda is injured as a bystander to one of Conrad’s bar fights, she decides it’s time for a fresh start. She ends things with Ted and leaves her career as an audiologist to move to Manhattan and stay with Al and his new wife Marie. While out looking for an apartment and exploring the city, Veda gets on a bus that ends up changing her life. The bus is hijacked by a mentally unstable man named Peter who is obsessed with Peter Pan and thinks he can “save” the passengers by shooting them and taking them to Neverland with him. We do not know the complete outcome of the hostage situation until the last line of the novel, as it is interspersed with Veda’s backstory in Vancouver. The two timelines gradually merge, until we are able to see the aftermath of the shocking, unpredictable incident and its ongoing effects on Veda and the people who love her. Although this dramatic event is at the centre of the novel, it is most of all a character study, exploring the relationships between siblings and the bonds of childhood friends. The literary connection to Peter Pan can be found in more than just Peter’s love for the story – it can also be found in the siblings’ history of living with secrets, and refusing to grow up. Veda is able to connect with Peter because of her own unstable brother, although Conrad is troubled in a very different way. Veda loves unconditionally, not only Conrad but Ted too, and her obsession with Peter becomes yet another unhealthy relationship filled with misplaced loyalty. There is much to explore in this novel, and the depth of character is impressive. I really enjoyed the tight balance of thriller and psychological character study, and I will certainly read more by Grace O’Connell. I received this book from Random House Canada and NetGalley in exchange for an honest review. I was interested in this title because of the fact that it was set in Vancouver (Very few books are and I think it's a shame because it's such a beautiful city). Unfortunately I found myself quite underwhelmed throughout the read. O'Connell does have a gift when it comes to imagery, but I found the story to be less than captivating. It's dangerous to tell a story as a reminiscence from the main characters point of view, and in this case I think it works against the author by taking away from the I was interested in this title because of the fact that it was set in Vancouver (Very few books are and I think it's a shame because it's such a beautiful city). Unfortunately I found myself quite underwhelmed throughout the read. O'Connell does have a gift when it comes to imagery, but I found the story to be less than captivating. It's dangerous to tell a story as a reminiscence from the main characters point of view, and in this case I think it works against the author by taking away from the suspense. I also think that mental health is a very difficult theme to do well in a fictional format and I didn't see this book as saying anything new or interesting on the subject. Overall I enjoyed her writing style, just was fairly uninvested in the story and characters. Phenomenal! "Be Ready For The Lightning" by Grace O'Connell is a wonderful book! The storyline follows Veda a girl involved in a hostage situation. Her character arc is fascinating and there is a perfect amount of character development for her character. Grace has done a good job creating her character and the development for Veda is on point! Accompanying Veda is a fantastic cast of supporting characters. All of them bring unique characteristics to the story. Each character is memorable and they Phenomenal! "Be Ready For The Lightning" by Grace O'Connell is a wonderful book! The storyline follows Veda a girl involved in a hostage situation. Her character arc is fascinating and there is a perfect amount of character development for her character. Grace has done a good job creating her character and the development for Veda is on point! Accompanying Veda is a fantastic cast of supporting characters. All of them bring unique characteristics to the story. Each character is memorable and they all help to forward the plot. Grace is able to craft such interesting and likable characters, that they all feel very real and relatable. The story in the book follows two story lines, one past and one present, both of which are interesting to the reader. One storyline provides terrific character development and a heartwarming story. The other storyline puts you right into the action and danger. I like the fact that grace was able to intertwine these two story lines and the story flowed really smoothly. Some books have trouble when there are two story lines, but this book combined the two story lines perfectly. Be Ready for the Lightning follows the narrator Veda’s life before and after a traumatic event – being trapped aboard a Manhattan bus during a violent hostage situation. The story centres around the fractious relationship between Veda, her brother, Conrad, and their core group of friends as they all attempt to approach normalcy in their lives despite addictions issues, Veda’s crippling anxiety, Conrad constantly picking fights with strangers, and things just generally not turning out the way the Be Ready for the Lightning follows the narrator Veda’s life before and after a traumatic event – being trapped aboard a Manhattan bus during a violent hostage situation. The story centres around the fractious relationship between Veda, her brother, Conrad, and their core group of friends as they all attempt to approach normalcy in their lives despite addictions issues, Veda’s crippling anxiety, Conrad constantly picking fights with strangers, and things just generally not turning out the way they’d envisioned. Throughout her story, O’Connell continually jumps back to the time on the bus to frame the plot and connect its various elements, and I think this is the core source of my dissatisfaction with the book. Right off the bat, we’re placed in the middle of the action to presumably hook the reader, but we’re presented with dissonant details from our narrator in a likely attempt to help characterize her. (This takes the form of calm asides working their way into the middle of the violence and confusion – which greatly hurt the pacing and the response the author was likely attempting to cultivate from the readers at the time – and lighthearted observations of her violent captor right in the middle of the carnage – which may make more sense as we get to know our protagonist, but send mixed messages on how the reader should be responding to the situation.) While I don’t necessarily blame the author for starting off this way, as a lack of interest in the first few pages can cause potential publishers to overlook a manuscript or can cause a potential audience to stop caring and abandon the book, it feels as though she’s putting too much emphasis on the hook at the expense of the overall story. For, the story proper, outside the bus-jacking, is full of realistic characters that I grew to feel for in spite of their flaws. If we were given the chance to better understand Veda before she got on the bus, we would have been able to eliminate the asides that kill the scene’s momentum and I expect it would have been easier to care about what was happening when we got there. Of course, this discussion only really pertains to the first time we encounter the bus-jacking, but the scene, the framing device, returns at the start of each chapter, and it’s almost like a recurrent, surreal aside to an otherwise thoughtful story, the only element I really had a hard time believing. It comes back each time in a tiny snippet of the overall encounter, teasing a payoff that never quite felt big enough, and this makes me wonder if a change in its presentation would be enough to make me like it, if turning it into a linear element in an otherwise linear story would significantly improve it in my mind. But, after glancing at reviews on Goodreads, it also seems just as likely that I just didn’t get it, as our time on the bus appears to be many readers’ favourite part of Be Ready for the Lightning, so you can probably judge this as nowhere near as important as I’m making it out to be. O'Connell has a gift for imagery, for dialogue, for writing--and this skill makes Be Ready for the Lightning a great read. Veda has always kinda floated through life, doing things more because she was expected to than actually following some inner desire. As a result she finds herself somewhat lost, not really knowing who she is and wondering why she lets life, and people, walk all over her. But then she gets caught up in a hostage situation on a bus, and everything changes. The story switches bac O'Connell has a gift for imagery, for dialogue, for writing--and this skill makes Be Ready for the Lightning a great read. The story switches back and forth between the bus and Veda's childhood through to the aftermath of the attack. Sometimes this worked, and sometimes it didn't. Though interesting to watch Veda evolve (and somewhat discomfiting as I know all too well her feeling of displacement, of not know why she does the things she does), I didn't really feel like I knew her by the end, or that she still even knew herself. She still let other people tell her, although it is slowly dawning on her that what she sees as weaknesses in herself--mainly her unquestioning compassion for others--is actually strength. However, so much time is spent in the past, in explaining how Veda got to this point, that there is little time to fully explore this. The narrative would have been a little tighter, I think, if O'Connell kept some of these past instances as quick backstory. This is clear with the late introduction of Sunny, an interesting and complicated character that did much more than the others to show Veda to herself, she was just not given the time to fully do so--their relationship was too compressed and a lot left unexplored. Too much time spent on the past and what Veda was not. There was a large cast of characters, mostly there to bounce against Veda in their own way, but she never really let them in; or had the strength enough to tell them how she felt. (Again, something I can much sympathize with, making her all the more realistic.) But another character that played a large role was her brother Conner, who is set up as a man-boy unable to stop getting in fights that leave both parties bloodied and running from cops. Although this serves to propel on part of the narrative, O'Connell simply paints in violent tendencies in one light--that he is a monster of sorts and everyone is afraid of him. He is cowed only when something horrific happens, but still it is implied that he could snap at any moment. But what of why he got that way? To me, it seemed as though Conner had an excess of passion, something, like Veda, he had a hard time articulating but instead of retreating inward like his sister, he lashed out when believing he was correcting injustices. I found him rather complex, but with so many competing story lines, the author did not have time to really explore this. Thanks so much to NetGalley for providing me with ane-ARC of this book for an honest review. As always, all opinions are my own. I thought this book was going to be just a thriller, but I am so glad it turned out to be so much more than that. The story follows the main character, Veda, in two timelines: one present day and one beginning in childhood and progressing forward until the two timelines meet. In the present day, Veda is visiting some friends in New York City and while she's riding the bu Thanks so much to NetGalley for providing me with ane-ARC of this book for an honest review. As always, all opinions are my own. The story follows the main character, Veda, in two timelines: one present day and one beginning in childhood and progressing forward until the two timelines meet. In the present day, Veda is visiting some friends in New York City and while she's riding the bus one day, a man hijacks the bus and soon it becomes a terrifying hostage situation. The second timeline focuses on everything up to that point growing up in Vancouver, her friendships as a child, her brother, Conrad who never seems to back down from a fight, etc. Like I said, this book isn't really a thriller. Sure, there is the hijacking, but the whole situation is pretty much stretched out over the entire book and frankly, I became more engrossed in Veda's life than the bus. I'm not too familiar with hijacking/hostage taking but from my general knowledge and movies, I think O'Connell portrayed it fairly accurately. There was a police negotiator who was trying to talk the man down and the situation seemed to be well planned. The part I really enjoyed, however, was Veda's life before. She narrates the story starting back when she and her brother were young, with their friends Ted, and brother-and-sister Al and Annie. She tells of growing up with a mixed heritage, half-Korean and half-Irish, what that looked like and how that affected her and her brother. Veda spins an enchanting tale of her life and even though there isn't anything particularly special or significant that happens, I couldn't put this book down. I wanted to see how things turned out and what was going to happen next, not because the story was thrilling, but because I was genuinely invested in the characters and their story. For the most part, this book is set in Canada, specifically Vancouver, however, there are references to other provinces and Canada in general throughout. I don't remember the last time that I read a book that made me so excited to see Canadian references! As a Canadian myself, I was also pleased to see that O'Connell didn't just take typical Canadian stereotypes and wedge them into the story. Being a Canadian writer herself she is able to include details that didn't come across as cheesy. I really loved this story as a whole and I'm sure there are a few flaws that I am overlooking but I think I've found a new favourite. There’s a lot to love about Grace O’Connell’s sophomore effort, the first being the wonderful title. I’m not sure what it is exactly, but the phrase”Be Ready for the Lightning” seems to be a call for action and alertness as you begin reading which builds the anticipation until major events begin to take place. But unlike a typical crime thriller, this is a very literary book, delving into the protagonist’s inner life just as much as what’s going on around her. I don’t want to give anything away so my summary of the plot might seem a bit vague, but essentially it’s about Veda, a young woman who grows up alongside her older brother who is prone to violence among strangers. After a particularly dangerous encounter back home, Veda moves to New York to clear her head, and finds herself in a hostage situation on a city bus. The chapters are made up of flashbacks to Veda’s childhood and early adulthood interspersed with present-day live action of the hostage situation. The book continues on from there, where some very surprising yet believable events take place. Even to the very last page I kept expecting horrific things to take place, so like the title suggests, you are kept on your toes for the entire novel. O’Connell is an up-and-coming star of the Can-Lit world. She’s written one well-received book before this one called Magnified World, which I also really liked. And not that this would make much difference to most readers, but she is literally one of the nicest people I’ve ever met. Although I haven’t spent much time with her I do recall being utterly charmed by her and her kindness. I’m not sure whether this comparison would make her cringe, but I saw aspects of her main character Veda reflected in O’Connell herself. I can’t point to any specific reason for this belief, but when I imagined Veda in my head, I saw O’Connell’s face. Weird I know, but I think many readers picture the authors inhabiting the characters they write on a regular basis. I was captivated by this book for a few reasons; the suspense is deftly doled out throughout the book so I kept turning the pages even after my self-appointed bedtime of early as possible 10pm, the main character of Veda is flawed, likeable and extremely realistic and the content matter is timely because the recent threats of terrorism seem to be forcing everyone on edge, regardless of whether these fears are rooted in reality. It’s obvious O’Connell is a creative writing teacher because she doesn’t make the obvious mistakes that other writers tend to, and it’s the kind of book that other writers WISH they wrote. I have high hopes for this one as award season rolls around. So when you read a book, do you sometimes picture the author as one of the characters, or is it just me? Does this mean I have a lazy imagination? Comment below! The #wastemytime trend from 2016 carried over into 2017 with this book. The premise sounded really interesting; the main character gets trapped on a bus with a gunman, the windows are spray painted black so the police can't see in, and he holds them hostage. Sounds interesting enough right? Except this book did the complete opposite. You would get 3 long (boring) chapters of her life thus far, and then get one small taste of her being on the bus. With about 100 pages left we get an entire chapter The #wastemytime trend from 2016 carried over into 2017 with this book. The premise sounded really interesting; the main character gets trapped on a bus with a gunman, the windows are spray painted black so the police can't see in, and he holds them hostage. Sounds interesting enough right? Except this book did the complete opposite. You would get 3 long (boring) chapters of her life thus far, and then get one small taste of her being on the bus. With about 100 pages left we get an entire chapter dedicated to her day before she got on the bus, leading you to believe the next chapter is going to be all about what actually happened on the bus. Wrong. Instead we get a page simply titled "after" and totally skip over the entire bus hostage taking. There were only 100 pages left so after getting over my anger, I finished the book (with numerous eye rolls and questions of "this is what we skipped over the bus scenes for?!") and in total I probably got around 8 pages of her actually on the bus and confronting the gunman. But don't worry! if you were really interested in her life we get to follow up with her always-ready-for-a-fight brother, her odd grouping of childhood friends, and her all consuming attraction to the gunman (yes you read that right, she actually kisses his comatose body a few times and befriends his mentally ill sister in some weird friendship thing so she can be closer to him). Be Ready for the Lightning by Grace O'Connell is a work of fiction. First, let me thank NetGalley, the publisher, and of course the author, for providing me with a copy of this book in exchange for an honest review. Second, I must confess that this is not my normal genre, so although I my rating may not be high, I know the majority of people will eat this one up. The three stars that I give this book is solely for the prose. O'Connell is a really good writer. I did, however, have a problem with the Be Ready for the Lightning by Grace O'Connell is a work of fiction. I did, however, have a problem with the actual plot. It told the story of Veda, a young woman from Vancouver, who is held hostage on a bus in New York, and whose bravery saves the day. It alternates between Veda's life before and after the event. It is a tale of friendship, love, family and bravery. It is also a story of mental health issues, violence, lies and deceit. Unfortunately, as good as this plot sounds, it missed the mark. There was no excitement, no suspense. I actually liked the character of her brother Conrad more than Veda. He, at least had some substance. It became a very long read. Again, I really enjoyed the writing. It was crisp, clean, and her characters were quite deep (if a bit boring). That and the fact that the author is Canadian, earned Grace O'Connell the 3 stars. Now, I know there will be a lot of others who find this book thrilling, so please, give it a chance. These are only my opinions, and they really only matter to me! Thank you to Penguin Random House Canada and Grace O'Connell for the free advance copy! Veda, an audiologist from Vancouver with a complicated circle of family and friends, moves to New York where she becomes an unlikely victim - and hero - of hostage situation on a Manhattan bus. From the first page, I really enjoyed this book. The prologue is gripping and the protagonist is engaging, interesting and her voice is well-written. This book had the potential to be five-stars, but it meanders Thank you to Penguin Random House Canada and Grace O'Connell for the free advance copy! From the first page, I really enjoyed this book. The prologue is gripping and the protagonist is engaging, interesting and her voice is well-written. This book had the potential to be five-stars, but it meanders a bit too much. For a book that starts so strong, the ending, and really the second half of the book, is extremely anti-climactic. The post-shooting story line felt disingenuous and stilted, especially compared to the story leading up to it. I was disappointed at the lack of catharsis or development following the protagonist's trauma. A semi-recent giveaway win, I'm not sure I would have picked up Be Ready for the Lightning by Grace O'Connell on my own otherwise, but I was intrigued enough by the synopsis–plus, it's a Canadian author–to give the book a try. This is the story of Veda, who finds herself on a bus in a hostage situation. The story then switches to her childhood in Vancouver, to the bond she had with her brother, despite his violent tendencies, and to the situations that lead to her being on that bus in the first A semi-recent giveaway win, I'm not sure I would have picked up Be Ready for the Lightning by Grace O'Connell on my own otherwise, but I was intrigued enough by the synopsis–plus, it's a Canadian author–to give the book a try. This is the story of Veda, who finds herself on a bus in a hostage situation. The story then switches to her childhood in Vancouver, to the bond she had with her brother, despite his violent tendencies, and to the situations that lead to her being on that bus in the first place. I have mixed feelings about this one... Grace O'Connell is definitely a talented writer and she manages to include a number of very poignant and striking observations about memory, growing up and family in a story that still has a lot of engaging plot elements. And yet, sometimes I felt like the novel was trying to do too much. The whole multiculturalism bit felt very forced and while of course it's timely, I failed to see the connection between that theme and the rest of the book. That being sa I have mixed feelings about this one... Grace O'Connell is definitely a talented writer and she manages to include a number of very poignant and striking observations about memory, growing up and family in a story that still has a lot of engaging plot elements. And yet, sometimes I felt like the novel was trying to do too much. The whole multiculturalism bit felt very forced and while of course it's timely, I failed to see the connection between that theme and the rest of the book. That being said, I still enjoyed the second half much more than the first sections so if you can manage to get through the first hundred pages, I don't think that you'll regret it. The cover also doesn't do justice to the novel, it has a very YA feel to me, which initially turned me off from picking up the book sooner. Veda and her brother Conrad (Connie) are the main characters in a group of five close friends that grew up together. Everyone tip toes around Conrad's constant fighting that began in adolescence, which to me, is the meaning for the title. Veda and Conrad's parents ruminate over why Conrad didn't change after high school. The expectation for him to attend university and then get a proper job was shattered when he didn't snap out of it. Narrator Veda hooks up with one of The Five, Ted, and they fa Veda and her brother Conrad (Connie) are the main characters in a group of five close friends that grew up together. Everyone tip toes around Conrad's constant fighting that began in adolescence, which to me, is the meaning for the title. Veda and Conrad's parents ruminate over why Conrad didn't change after high school. The expectation for him to attend university and then get a proper job was shattered when he didn't snap out of it. Narrator Veda hooks up with one of The Five, Ted, and they fall into a relationship of convenience. She unfortunately spends many years hoping he will become the boyfriend she wants. It's when she becomes a hostage on a New York city bus that the most fascinating part of this book takes place, when she develops character. The interaction between her and the hijacker is unusual. This is a wonderful book! Grace O'Connell has created living characters that leap off the page. We follow Veda through some of her childhood events and see her friends and relations with all their good and bad traits. Their actions and choices resonated through her, revealing that we never know if we said the right thing or made the right choice. Reasons for actions and reactions, as well as how those truly affect others, are unknowable in others and in ourselves. We watch as she remembers and fo This is a wonderful book! Grace O'Connell has created living characters that leap off the page. We follow Veda through some of her childhood events and see her friends and relations with all their good and bad traits. Their actions and choices resonated through her, revealing that we never know if we said the right thing or made the right choice. Reasons for actions and reactions, as well as how those truly affect others, are unknowable in others and in ourselves. We watch as she remembers and forgets, acts or doesn't act. Each section was framed wonderfully by pieces off the horrific event that touched Veda's life. Through the novel, wee learn more about Veda as she begins to understand herself, her own limitations and her strengths. It was a truly awesome book. I felt so connected to Veda and her world, like it was mine. A well-written book about the complexities of sibling relationships. As other reviewers have said, it begins with an intense action scene, but spends most of its time on the main character's backstory. I liked how the story went back and forth between the present and the past -- it helped explain Veda's response to the violent scene on the bus, drawing parallels between the Peter the hostage taker and Conrad, Veda's brother. It's not an action-packed page turner, but the undercurrent of suspense A well-written book about the complexities of sibling relationships. As other reviewers have said, it begins with an intense action scene, but spends most of its time on the main character's backstory. I liked how the story went back and forth between the present and the past -- it helped explain Veda's response to the violent scene on the bus, drawing parallels between the Peter the hostage taker and Conrad, Veda's brother. It's not an action-packed page turner, but the undercurrent of suspense builds the story and intrigue. And Veda's experience offers a thought-provoking and empathetic perspective on the conflict between healthy and harmful loyalty toward another person. I’m a Toronto-based writer and editor and the author of Magnified World (Random House, 2012). I’m represented by Martha Magor Webb at McDermid & Associates and my publicist is Ruta Liormonas at McClelland & Stewart. My work has appeared in publications including The Walrus, Taddle Creek, the Globe & Mail, the National Post, Quill & Quire and the Journey Prize Stories. I’ve been nomi I’m a Toronto-based writer and editor and the author of Magnified World (Random House, 2012). I’m represented by Martha Magor Webb at McDermid & Associates and my publicist is Ruta Liormonas at McClelland & Stewart. My work has appeared in publications including The Walrus, Taddle Creek, the Globe & Mail, the National Post, Quill & Quire and the Journey Prize Stories. I’ve been nominated for the RBC Bronwen Wallace Award and two National Magazine Awards for fiction. Previously, I taught creative writing at George Brown College and I now teach at the University of Toronto. I also write a books column for This Magazine, work as a freelance writer, ride a crummy but beloved bike named Billy and chase after cats on the sidewalk to pet them.